Experts were brought together in the fields of food science, education, economics, accessibility and sports from local organisations and educational institutions, including Institute of Technology Tralee and Inisfallen Training and Development. Enjoying a private reception at Muckross Park Hotel, they were briefed on how they can help to bring international events and conferences to Ireland through Fáilte Ireland’s Conference Ambassador Programme. The group then enjoying a special dining event at the hotel, with a menu prepared Derry Clarke. Through the programme, Fáilte Ireland’s Meet in Ireland team identify influencers across a myriad disciplines and encourage them to bring an international conference here. 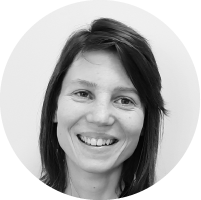 Due to the structured nature of this industry sector, it’s possible to research and identify associations that have the potential to come to Ireland, and also identify a member of that association influential in his or her field. Once an influencer has been identified, is contacted and agrees to bid for an international conference, he or she becomes a Conference Ambassador. Fáilte Ireland provides practical and financial aid to support them through their journey, from bid stage to implementation. Over 75% of all international association conferences which come to Ireland do so at the direct invitation of a local Irish member or host. 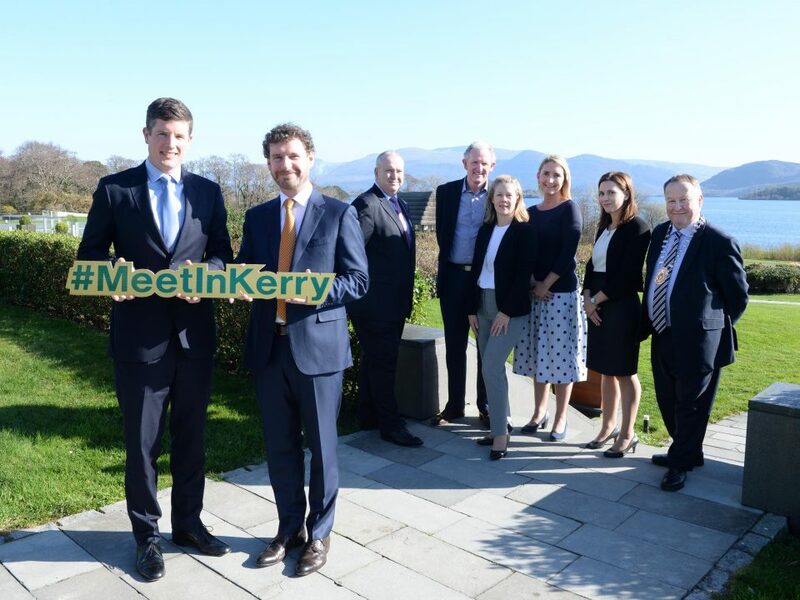 The Conference Ambassador recruitment event in Kerry alone has the potential to bring almost 2,000 delegates to the area, worth an estimated value of €3.1m. Corporate Social Responsibility is defined as a commitment to contribute to the economic, environmental and social sustainability of a community. The Kerry Convention Bureau (KCB) believes passionately in the way Corporate Social Responsibility (CSR) initiatives can enhance Business Events and has seen first-hand the positive mutual benefits that such activities can bring when organisations choose to integrate a CSR component into their conference, incentive or event when held in Kerry. To develop available options for groups visiting Kerry, KCB launched a CSR partnership with Kerry Parents and Friends Association (KPFA) in March 2018. KPFA support families of people with an intellectual disability across the region of Kerry. It provides Residential and Day services together with Respite and Home Support, Training for Life, Community Integration Programs and individualised services for more than 200 adults. 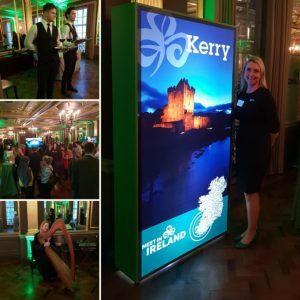 In celebration of this new partnership, Kerry Convention Bureau (KCB) were delighted to incorporate a CSR element in to its recent destination familiarisation program and use this activity to raise money for KPFA which could go towards purchasing items needed to furnish their community houses. 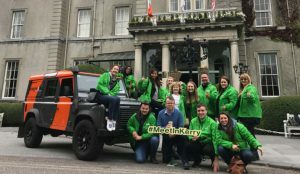 The program held in September showcased a range of engaging activity options for event planners bringing meetings, conferences and events to Kerry including the launch of Go Team Killarney, a bespoke teambuilding activity offered by the bureau’s newest member Orangeworks. This interactive treasure hunt around Killarney Town was tailored to incorporate Kerry Convention Bureau members, demonstrate event and accommodation infrastructure and capacities and included a series of challenges where for each challenge completed, the teams were awarded points which generated a total of €350 to be donated to KPFA. 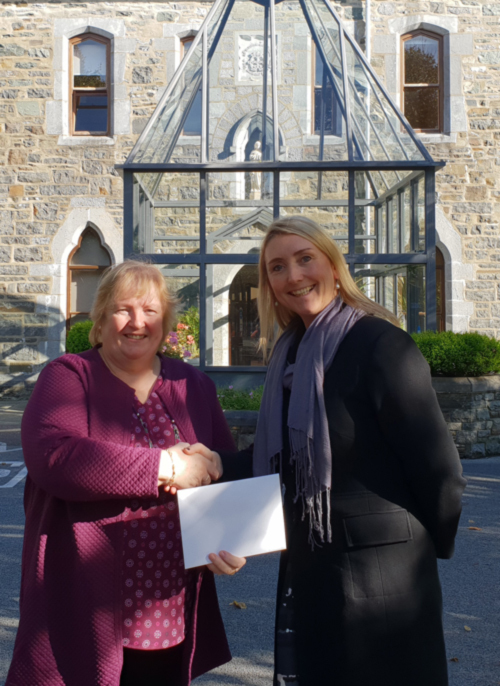 KCB Sales Manager Becky Hargrove recently met with Marie Linehan, Chief Executive of KPFA to present the cheque. #TeamKerry headed to London this week to join UK Association Buyers at the annual Meet In Ireland Association Networking event. Held in the Hotel Café Royal, this event is a fantastic opportunity for the #MeetInKerry team to work alongside Dublin Convention Bureau and our regional convention bureau partners Cork Convention Bureau,Shannon Region Conference and Sports Bureau and Galway Convention Bureau to engage with event professionals and share with them why they should #MakeItIreland for their next Association Conference. 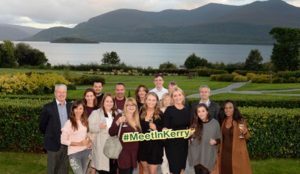 A group of top UK event planners spent the weekend in Kerry and Cork on an educational trip, organised by Fáilte Ireland, in conjunction with Tourism Ireland. The trip provides the opportunity to showcase the region and to expand their knowledge of what Ireland has to offer UK planners for exclusive incentive programmes and corporate meetings, so that they can encourage their corporate clients in the UK to host their next event in Ireland. 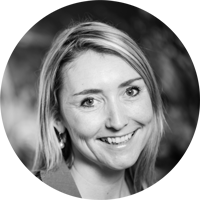 Each of the event planners represents clients based in a number of different industries in the UK market including automotive, insurance, finance, pharmaceutical and IT. 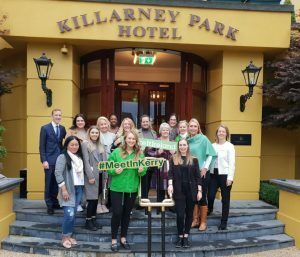 With an itinerary designed to highlight the many attractions in the region that cater for corporate clients, the group visited Killarney Park Hotel, Great Southern Hotel, Major Colgans, JM Reidys’, Muckross Traditional Farms and the Hotel Europe and Resort. 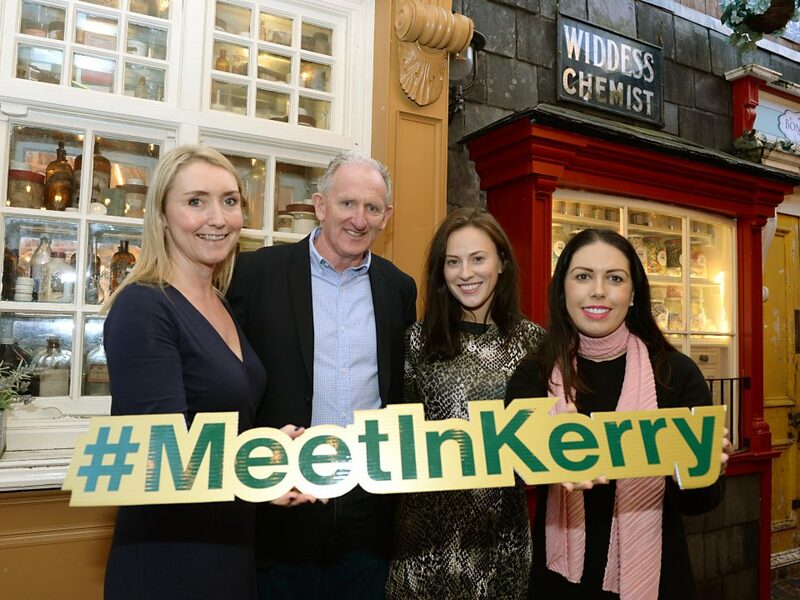 Kerry Convention Bureau showcased Kerry as a unique and inspiring business tourism destination over the weekend to eight influential Meetings, Incentives, Conference and Exhibition (MICE) event planners from the United Kingdom, Sweden and Dublin. Promoted as an ‘Experiential Weekend in Kerry’, the group of senior, who were also joined by Fáilte Ireland’s Meet in Ireland team were given the opportunity to come and experience the event planners best of what Kerry has to offer for business events on a relaxed three- day educational program connecting them with local business event suppliers. 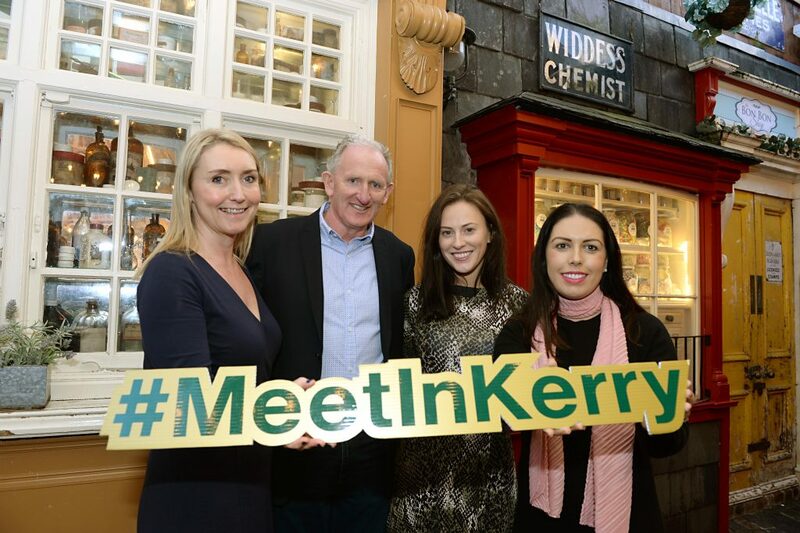 With an itinerary focused on Killarney and Tralee, the program was designed specifically to boost Kerry’s profile as a vibrant and spectacular destination for business tourism. Offering a combination of immersive experiences and industry networking, the group were left with an unforgettable impression of a compact destination that delivers world-class MICE events by applying invaluable local heritage, expertise and knowledge to achieve uniquely successful events for clients. As well as enjoying VIP tickets to Riverdance on Saturday evening, the program showcased a range of engaging activity options including the launch of Go Team Killarney, a bespoke teambuilding activity offered by the bureau’s newest member Orangeworks. This interactive treasure hunt around Killarney Town was tailored to incorporate Kerry Convention Bureau members, demonstrate event and accommodation infrastructure and capacities and included a Corporate Social Responsibility (CSR) component by enabling the participants to raise money for the bureau’s CSR partner, Kerry Parents and Friends Association (KPFA). For each challenge completed, the teams were awarded points which generated a total of €350 to be used towards purchasing items needed to furnish KPFA’s community houses. David Bassett, Managing Director of Orangeworks said We were delighted to partner up with Kerry Convention Bureau to debut our latest interactive treasure trail, Go Team Killarney. 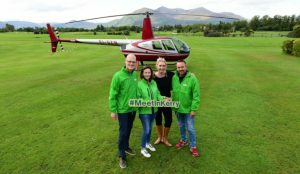 As Kerry is one of the most popular destinations in Ireland for both leisure and business tourism, Killarney was a destination we had to add to our Go Team locations! In addition to the treasure hunt and Riverdance, the action-packed itinerary included visits to a range of 5* and 4* KCB member hotel properties and venues across Killarney and Tralee, a workshop learning an Irish dance on the stage at Siamsa Tire, Ireland’s National Folk Theatre jaunting car trip through the National Park and a memorable finale of a short helicopter trip, courtesy of Killarney Racecourse which gave the participants a bird’s eye view of Killarney town and its beautiful surrounds of lakes, mountains and 26,000 acres of National Park. 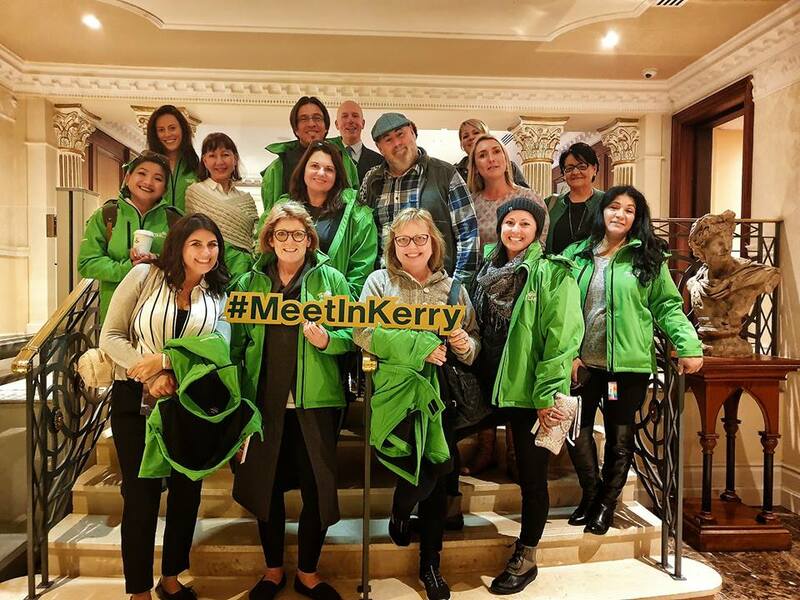 A group of travel incentive buyers from Canada visited Ireland on a Meet in Ireland familiarisation trip and were given the opportunity to travel around Kerry to learn more on how they can programme these counties for future high-end incentive programmes for their corporate clients in Canada. 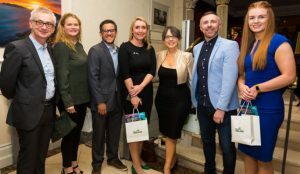 The visit was hosted by Fáilte Ireland’s Meet in Ireland team, in collaboration with Tourism Ireland and for the majority of the Canadian buyers, this was their first time to travel to Ireland. 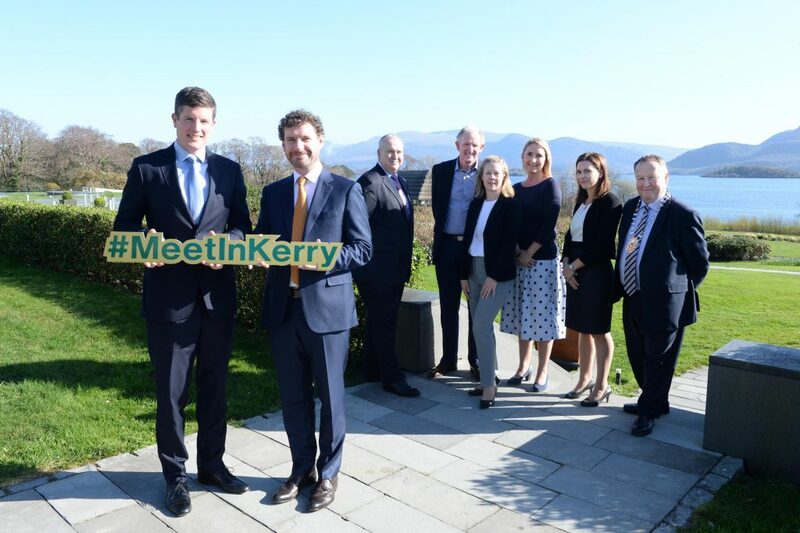 Following their visit to Kerry, the group also visited Cork before flying home. 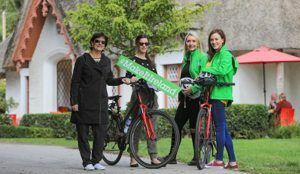 A bespoke itinerary was designed for the group to showcase what Kerry has to offer and included a cycling tour of the Killarney National Park and House, taking in the Lakes of Killarney and Ross Castle from St Mary’s Cathedral.